Rosanne Cash is an artist of integrity. Anyone who is familiar with Cash knows that she always tried to not be pigeonholed in order to achieve something different yet true. Although she’ll be forever synonymous with her famous country music family, Cash rode on the wave of the Nashville hit machinery in the ‘80s, only to go against expectations with some critically acclaimed records highlighted by the 1990 masterpiece Interiors. And she’s also a survivor from losing her father, mother and stepmother within a short period of time to overcoming a brain operation. But Always Been There, written by Michael Streissguth, who had previously penned a 2006 biography of Johnny Cash, is not a strict, exhaustive biography of the singer-songwriter, although it does trace moments in her life and career. What the author presents, however, is someone on a journey in revisiting and reclaim her musical roots. That is symbolized by “the list,” which, back in 1973, was given to a young Cash by her famous father Johnny containing 100 important songs that an emerging musician should be familiar with. 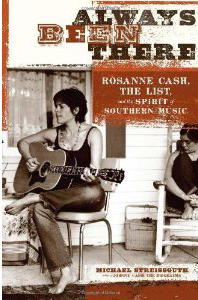 Thirty-five years later Rosanne Cash recorded an album of the songs that might have been on that list (at the time of the book’s writing, she was never able to find it). The List is the driving force for this book along with the album. This insightful approach to telling Cash’s life in this manner is more compelling than the standard biographical fare. The author was given practically unlimited access to Cash last year as she was recordtng the new album and touring parts of Europe. Streissguth delves into what the songs meant to Cash and provides a glimpse of her recording in the studio with her producer-husband John Leventhal. Accompanying her along the tour stops along Zurich, Scotland and Berlin, Streissguth documents her processes and ideas as well as interactions with her husband, manager and the audience members. More telling is her feelings about her family, especially about her father, which are poignant as it is revealing. Streissguth makes no bones that he is a fan of Rosanne Cash but he doesn’t stray away from his primary role as observer. We feel like we’re with Cash in the studio as she’s summoning herself to be one with the song emotionally, or why this particular song or artist resonates with. Always Been There achieves in being both a chronicle of an artist still at the top of her game but also the love for music that inspires and defines where we come from.